The words mirrored what I believe and share in my book “Everything Changed When I Said ‘I Do’ – Preparing for and Living as a God-First Stepfamily” about how marriage should be viewed. Marriage is not something you do and then wait for the marriage to help you and solve your problems. Marriage is a beautiful union created by God in the perfect Garden. It represents an intimacy unknown to any other living creature. As a visual person, a “marriage box” is a great analogy as I believe when man and woman get married whether it is for the first time or the next time….they give “birth” to their marriage. Just as with any living thing, the marriage requires both the husband and the wife to love, protect, nurture, and grow the marriage. What have you done today to help your husband feel like a man and that you respect him? What have you done today to help your wife feel cherished and “your bride…your special girl”? It doesn’t take money. Perhaps you can make a phone call, write a note or a text. Prepare a favorite meal or dessert for him, tell him how much you appreciate him and be specific. Take out the garbage, clean up the dishes, or change a dirty diaper to help her. Here are more ideas: Back scratches, foot rubs, shampoo their hair, praise them in front of someone, a surprise lunch date, look them in the eye and say something sweet, hug, hold hands, kiss. 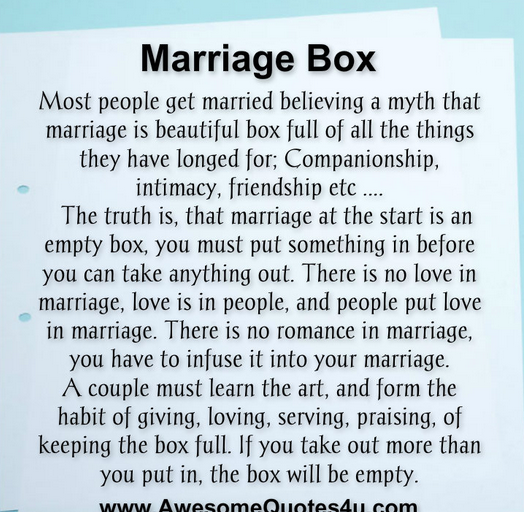 The “marriage box” is what will honor and glorify God, giving Him proper praise for your union. It is much easier to make emotional withdrawals than deposits. Be sure to fill your marriage box today with some love! There is no greater love in eternity than the Love of Christ on the cross. There is no greater love here on earth than an honoring, cherished, transparent, and respected marriage. 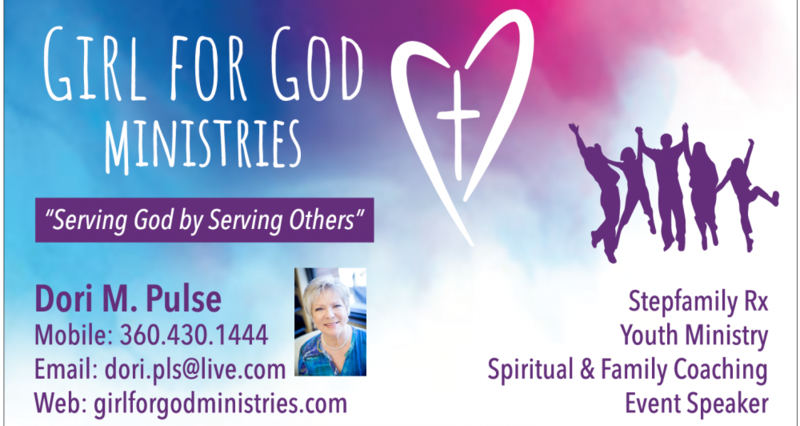 This entry was posted in Divorce, God in marriage, Relationships, Remarriage, Stepfamily, Stepmoms, Truth and tagged Christian, Divorce, Family, Marriage, Relationships, Remarriage, Stepfamilies, Stepfamily, Stepmoms by Dori Pulse. Bookmark the permalink. Thank you for the great post. I think this is true for any relationship.